I travel a lot for my job and I am always in search of a more user friendly, convenient and rugged suitcase or bag to help me move quickly through the airport. I have closets full of suitcases, duffels, backpacks, etc., each with their pros and cons but none of them were exactly what I was looking for. When I received the Lifepack from SOLGAARD I was extremely excited, one because it was a new suitcase and that alone gets me excited (hey, I’m a regular traveler so I kind of geek out on suitcases) and two, it offered a unique storage solution for my clothes, shoes, and toiletries that I have never seen before but we will get into that in a little bit. The SOLGAARD Lifepack is a carry-on sized hard sided roller suitcase that is extremely rugged and durable and comes with a collapsible closet that stows away inside the suitcase for easy packing and unpacking for your trip. The dimensions of the Lifepack are 21.6″ tall (including the wheels), 14″ wide and 9″ deep, complying with all airline carry-on size requirements (please double check with your airline on size requirements before taking this or any bag as a carryon) and has a 38 liter volume. The hard shell is made from jet black polycarbonate, which is reinforced with a gunmetal grey aluminum frame for the perfect balance of strength and weight. A TSA approved lock is integrated into the bag so you will never again worry about leaving your lock in a hotel room or having it bent or smashed as it dangles from zippers (this has happened to me on numerous occasions). The Lifepack also comes with a lifetime warranty. The SOLGAARD Lifepack comes with the suitcase and a collapsible closet system for easy packing and unpacking or when you just need to quickly get into your suitcase to find that one thing that would normally have you digging through your neatly packed bag. The Lifepack has been very well thought out and constructed. Starting with the suitcase itself, the shell is as sturdy and durable as I have ever experienced in a piece of luggage. The video on their website demonstrates being able to sit and stand on the suitcase with little give. The four wheels on the bottom are high quality and glide with ease, something that is a feature you look for if you have ever owned a bag that has cut costs by using low-quality wheels. The telescoping handle is very solid and doesn’t rattle around like with other bags I have owned. It responds to your movements instantly and glides with ease over hard floors, carpet, and concrete. On the underside of the handle is a very soft, plush grip that makes pulling this bag through an airport very comfortable in your hand. My favorite feature of the shell is the closing mechanism and the integrated TSA approved lock. SOLGAARD has eliminated the zipper and instead has used an attaché style closure so never again will you have to deal with a zipper coming off the track, getting a piece of clothing or the liner stuck in it or worry that your bag can be easily cut into even when locked. 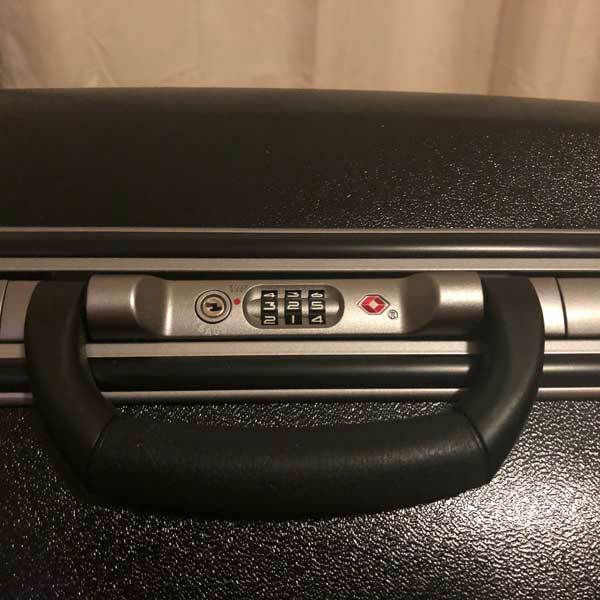 The lock is built into the frame on the shell directly under the side handle and used a 3 digit wheel locking system so you don’t need to remember where you put your key to your suitcase. All of the features mentioned above already make this my favorite hard-sided carry-on suitcase that I own but what really separates the Lifepack from the competition is the patented internal collapsible closet system that makes for extremely fast and easy packing and unpacking. As you can see in the pictures, this internal closet is made from extremely lightweight and rugged fabric and hangs easily from the trolley handle, allowing you to see all of your clothing easily and remove just what you need without rummaging through your bag to find a shirt or pair of socks. once packed, the closet collapses and fits easily into the suitcase where you can snap it securely into place so it doesn’t fall out should you open the suitcase while it is standing upright. I have always hated living out of a suitcase when I travel so before receiving this bag, I would get to my hotel and immediately unpack my entire bag and put the suitcase in the closet or on the side of the bed. Now that I am using this suitcase for my shorter trips, I simply open it, take out my collapsible closet, hang it from the handle and voila, I am unpacked. No more accidentally leaving a shirt or pair of pants in a hotel drawer that I forgot to look in, it’s all right there just as I packet it. No more storage cubes to separate my pants from my t-shirts and no more jamming all of my stuff into the suitcase as I race out the door to catch my flight, wondering if I left anything behind. The rugged design and durability of the shell is sure to impress even the most seasoned traveler and suitcase abuser. The collapsible closet has completely changed the way I pack and unpack and makes finding what you are looking for effortless. I am in love with the closure and locking system. I can’t count the number of times I have broken a zipper or got it caught on something, which always seems to be when I’m in a hurry. 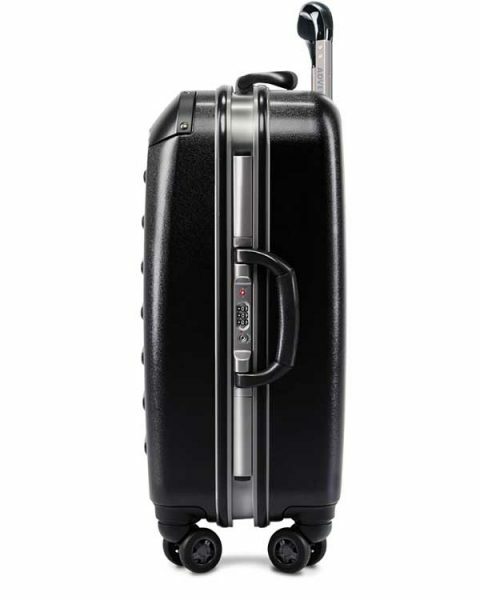 At $249 right now on their website, I think this is a great value for the quality and ingenuity you get with this suitcase. From a design and value standpoint, I honestly have nothing bad to say about this suitcase and portable closet system. At this time it is only offered in the one color that is shown in this review so for those of you who don’t like black luggage, this will be a negative, but for me, I prefer black luggage and the combination of the black shell and gunmetal grey frame is extremely sharp and professional looking. If you are looking for a high quality and durable carry-on sized roller bag I cannot recommend this product enough. If you are like me and are tired of having to sift through all of your neatly packed clothing to look for a specific item or are tired of spending time unpacking and repacking your suitcase when you get to your destination, this is a great solution for your travel needs. I have used this on three work trips and will NEVER go back to my other carry-on sized roller bags after using the Lifepack. Every feature of this suitcase is well thought out and engineered to make your life as a traveler easier and it is extremely successful in that effort. I could not be happier with this product and am very comfortable recommending it to our readers, which is why I am giving this the highest rating of 5 stars. Job well done, SOLGAARD! About a month ago I posted a review about this roller board carry on. I have taken this on 3 more short trips since then and wanted to provide a quick update and some thoughts I have had after more extensive use. To start with this has proven to be as rugged if a hard sided carry on as I have ever experienced. I actually watched a baggage handler drop it off of a 7 foot flight of stairs. I often fly small regional jets where these sized bags don’t fit in the overhead so I have to check it plane side. I was petrified when I saw it drop but the bag was completely unharmed. Seriously. Not a dent. I was very relieved then impressed that the claims made by Solgaard were legit. Since starting to use this, I have stopped using the internal closet system. 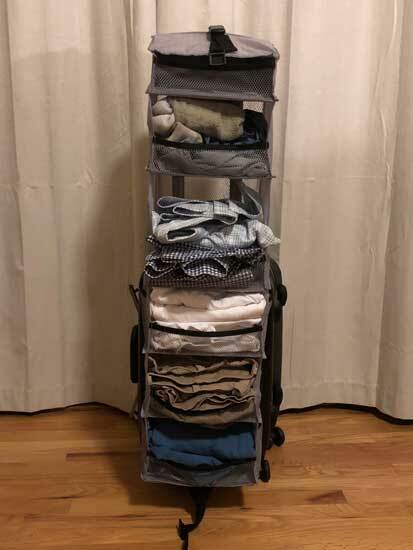 It is handy and can help with organizing but it requires me to fold my clothes into smaller spaces than I’m used to and I found that I wasn’t getting into my bag while traveling to grab a shirt so it was a bit more of a hassle for me than the convenience it added. As a regular suitcase it has been great. 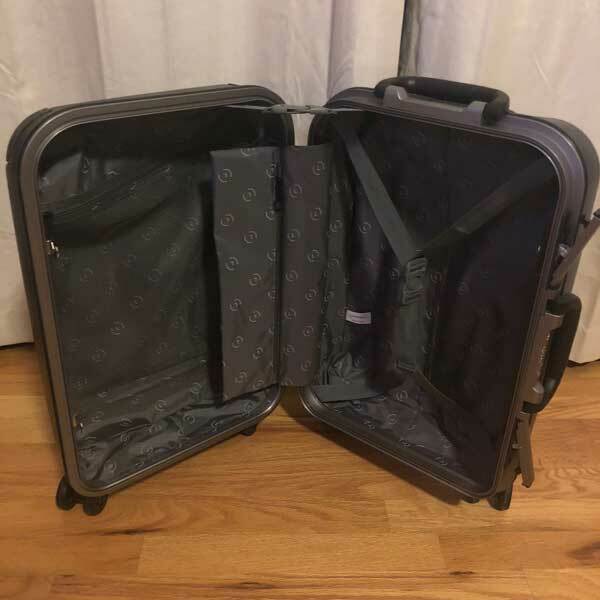 I wish both sides had straps to hold your clothes in place and I would recommend to Solgaard that they add this to the other side so clothes don’t fall out when you open the suitcase if you aren’t using the closet system. I will still use the closet when it’s appropriate but I have liked this bag without it. What using this closet system or not offers that other bags don’t is options. Something that is important to me when I travel. Since receiving this, it has been the only roller bag I have used in traveling. I even gave away my Samsonite I was using before this because I like this one so much more. I love the integrated locks so I never have to worry about losing it. The handle is extremely comfortable in my hand and the wheels glide with ease. One thing I would recommend to Solgaard is changing the telescoping handle to a thicker “T” handle rather than the standard two post handle. like most bags in this space there is a bit of wiggle in the handle but it is sturdy and stays locked. Every T handle I have seen and experienced are much more solid and have little or no wiggle, making it completely responsive to quick movements. Overall I still love this bag and use it regularly. A number of people have asked me about it and have written down the info so that tells me something about the bag. When regular travelers notice something as discrete as a black roller board bag you know you have something special. I still highly recommend this bag, despite my couple suggestions for improvements. 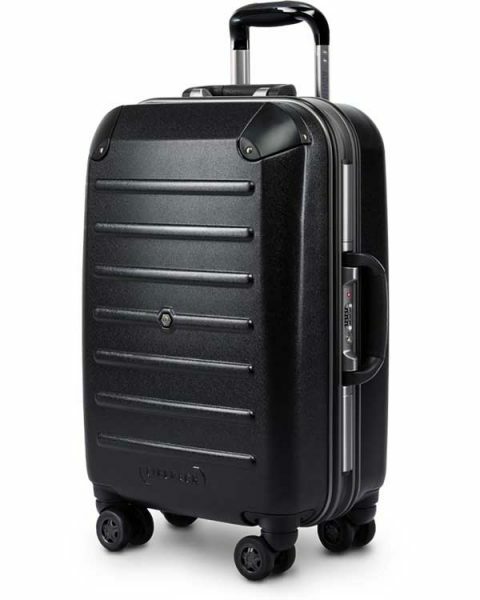 If anyone has bought one of these I would love to hear about your experiences and if you are using the closet system or have abandoned it and used it like a more traditional carry on. Where to buy: SOLGAARD or Amazon. Source: The samples for this review were provided by SOLGAARD. How do you handle suits and shoes? If the shelves consume the interior space, am I not losing the space for hanging clothes like suits and blazers? Great question and I’m sorry for not covering that. The underside of the lid allows for additional storage. I don’t put suits in carryon sized bags so I didn’t think to test that. I wear a size 14 shoe and those didn’t fit in the closet system so I put them in the lid with some other clothes. 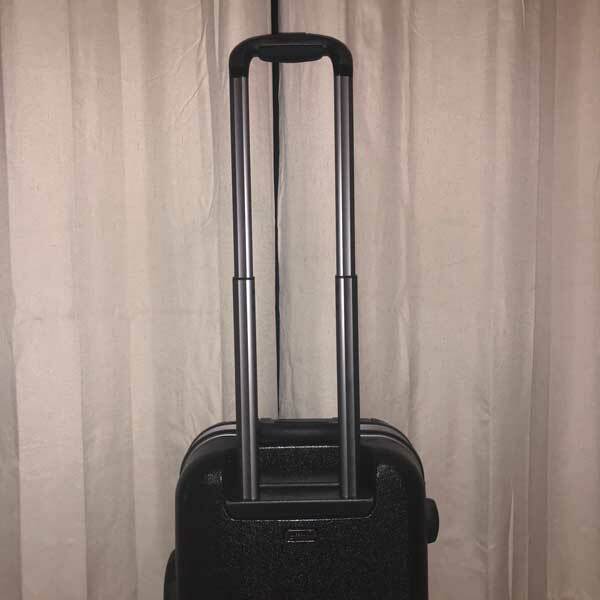 You can also use the suitcase without the closet system if you choose then it is like a regular hard sided suitcase but still is a great bag because of the strength, build quality and closing and locking mechanism. Please let me know if I can take any other pictures or answer any other questions for you. Thanks for the question! Thanks for this answer. I travel with a couple of extra pairs of footwear, whether sneakers or heels. Was wondering if anyone has purchased/tested it to see how much is packable in the lid. The lid can hold a lot. The problem is that there isn’t a strap or anything to hold anything packed in the lid in place. I’ve gone to using this almost exclusively without the closet but still use it at times. You can fit shoes in the lid with the closet still. Like in the update, I just wish they would have put some kind of strap or anything to hold items in place in that space. 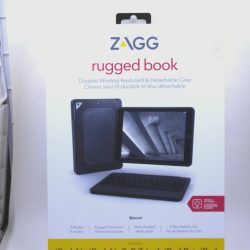 By the way, I’m no longer with the Gadgeteer but still use the products I wrote about so want to help with any questions you may have if you’re debating buying this product. I still love mine. It’s the most rugged hard sided carry on sized roller board suitcases I’ve ever seen. It will last a very long time. How many days could you pack for with the shelving unit inside? Also, would you have enjoyed this as much if you had spent the money on it vs receiving it for review?